From left to right, Ken Hulet, vice president of Engineering Services Co.; Tim Wood, a builder; and Tom DeBates, owner of Habi-Tek; install photovoltaic — or solar electric — panels on the roof of the Grumpy Troll, 105 S. Second St., in Mount Horeb on Friday. Mark Duchow, brewmaster at the Grumpy Troll, works in the brewery. From left to right, Tom DeBates, owner of Habi-Tek, works with Tim Wood, a builder, and Ken Hulet, vice president of Engineering Services Co., as they install solar panels on the roof of the Grumpy Troll in Mount Horeb. Photovoltaic panels installed last week on the roof of Mount Horeb's Grumpy Troll will soon enable the bar and restaurant to harness solar power to fuel everything from beer-brewing to pizza-making. 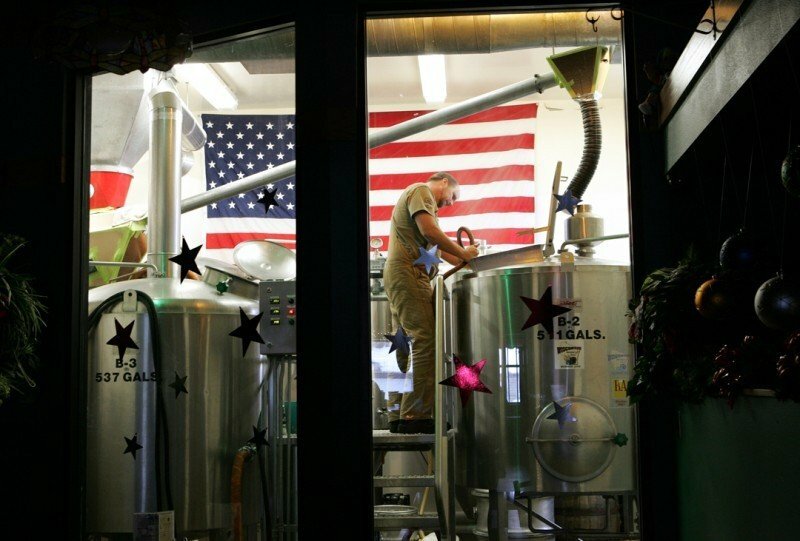 "A lot of the energy will be used for the brewery, as well as everything else that we do," said owner Doug Welshinger, adding the beer mash itself will still be boiled using natural gas. Once the switch is flipped , probably by the end of the month, Welshinger said the business will use about 95 percent of the electricity generated by the solar panels. "We do consume a lot of energy, there's no question about it," he said. The Mount Horeb Utilities will purchase all of the energy generated by the 38 solar electric panels - most at 30 cents a kilowatt hour - about three times the rate that a business customer would pay for the same electricity. The Grumpy Troll, at 105 S. Second St., will continue to purchase all of its electricity from the local utility at the normal rate, but will receive a monthly bill credit for the green power generated by the panels, helping to offset its total energy costs. The higher rate for sending electricity to the utility is part of an incentive program offered by Sun Prairie-based WPPI Energy, which includes Mount Horeb Utilities as a member. The higher rate will last about 10 years, said Ann Rodriguez, spokeswoman with WPPI Energy. "This will be our first business that will have solar (panels) that the utility will be buying back (energy) from," said David Herfel, electric and water superintendent with Mount Horeb Utilities. "I think we're going to see more and more of this renewable energy," he said. 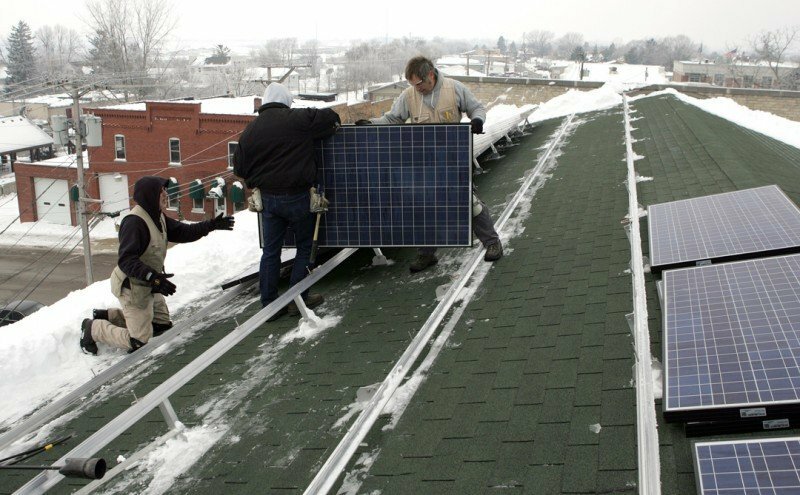 Niels Wolter, solar electric program manager with Wisconsin's Focus on Energy, said the organization has been seeing more businesses installing solar panels, in part because of tax credits available to help offset the cost. Businesses can typically finance half a solar electric project through Focus on Energy incentives and federal tax credits, he said, adding that Focus on Energy funded about 20 percent of the Grumpy Troll project. Wind turbines are more restricted in where they can be used, which is another reason for the growth in solar projects because all they need is sunshine. "Since 2002, the solar electric market has been growing pretty steadily by 80 percent a year," Wolter said. The building that houses the brewery was built in 1916. In 1996, it was remodeled into the Grumpy Troll - a restaurant, pizzeria and brewery that makes 500 barrels of beer a year for sale only on the premises. Welshinger said he started talking about the idea of solar panels a year ago as a way to be more environmentally friendly and raise the brewery's profile by being part of the "Travel Green Wisconsin" program. The project totaled about $54,000, and in addition to the Focus on Energy grant, Welshinger has applied for federal tax credits that could cover another 30 percent of the cost. "It was a big decision to make," he said, adding the next goal will be to add a solar hot water system to the building. Welshinger said he could achieve a payback on the system in about 10 years.